A mild-mannered financial advisor and a comic book shop worker who suffers from irritable bowel syndrome are the UK’s latest unlikely – SUPERHEROES. 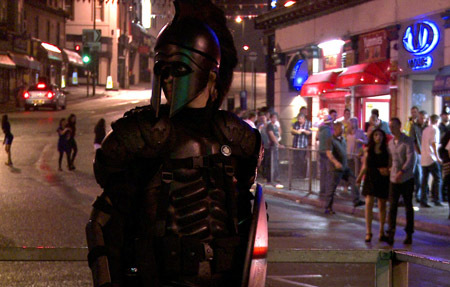 Father-of-two Will, aka ‘The Dark Spartan’, and sidekick ‘The Black Void’, patrol the streets every Friday and Saturday night looking for troublemakers. 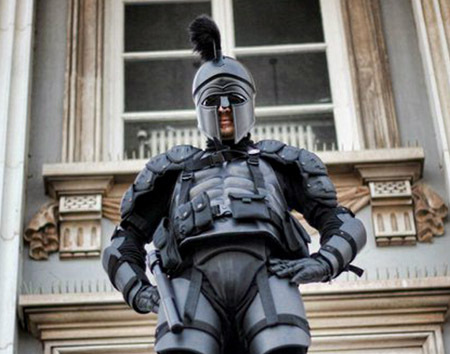 The pair wear all-black suits, complete with police riot shields and helmets bought on eBay, as they stalk the darker places of Torquay, south Devon. Will, 27, is accompanied by friend ‘The Black Void’ – a comic bookshop worker who wears a Spiderman mask and carries a cane for self-defence. But the ‘Black Void’ admits to suffering from irritable bowel syndrome which can become inflamed if the situation gets ‘a little tasty’. The unlikely crime-fighting duo, who yet to catch any troublemakers, feature on a Channel 4 documentary ‘First Cut: Superheroes of Suburbia’ this weekend. Will began patrolling the streets of his home town in Torquay a few months ago after ‘coming out’ to his wife Julie. Will found ‘The Black Void’ after trawling Facebook for a local sidekick and the pair quickly became friends. 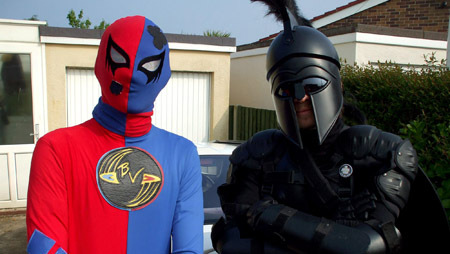 The ‘Black Void’, a comic book store worker from Torquay, hides his identity behind a Spiderman mask and uses a cane for comic book effect, like cartoon superhero Daredevil’. Director, Christian Watt said: ”It took me a few months to track these guys down and like all true superheroes they were reluctant to reveal themselves. The documentary also features nerdy 17-year-old crime fighter Kieran, aka ‘Noir, from Billingham, Stockton-on-Tees, who is plagued with panic attacks and nerves. Ex-soldier, Ken, 33, from Yeovil, Somerset, is also seen using smoke bombs and ambushing troublemakers by hiding in bushes. * First Cut: Superheroes of Suburbia, is on Channel 4 on Friday at 7.35pm.